IN THE 1930s, when the Duchess of Montrose began planting the woodland garden at Brodick Castle, her family’s ancestral home on the Isle of Arran, it was a landmark moment both for the family and horticulture in Scotland. The vision was bold: introductions by plant hunters were starting to transform the British landscape but many of these newcomers had yet to reach their full potential, and few people understood the impact magnificent stands of rhododendrons and magnolias would have on our gardens. The project was inspired by John Boscawen, husband of the duchess’s daughter Molly. Evacuated to Tresco Abbey as a child during the First World War, John learnt about horticulture in the famous subtropical gardens where he developed a love of tender plants. Both the setting and the climate at Brodick were ideal for the project. Reached by ferry from Ardrossan in Ayrshire, the red sandstone castle rises up against Goat Fell on the north shore of Brodick Bay. The mild climate, warmed by the Gulf Stream, combined with high rainfall, creates the perfect conditions for tender, acid-loving plants. In addition, the 18th century shelter belt of mature trees and Rhododendron ponticum that frame the castle were already in place. History also played a part: the romantic network of woodland walks laid out by her great aunt, Princess Marie of Baden, wife of the 11th Duke of Hamilton and cousin of Napoleon III, with whom she is reputed to have corresponded on the subject of gardens, formed a basic framework. An ancestral home of the Dukes of Hamilton since 1503, Brodick acquired its towers, turrets, crenellations and long terrace from the architect James Gillespie Graham in 1844. 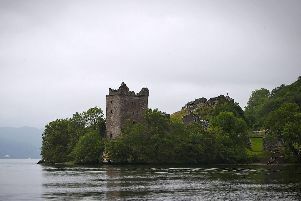 The castle passed by marriage to the 6th Duke of Montrose in the early 1900s and was gifted to the NTS by his daughter, Lady Jean Fforde, in 1956 in lieu of inheritance tax. Lady Jean, now 95, recalls the family’s excitement when a shipload of plants arrived in a flat-bottomed boat from Tresco, with tree ferns as ballast. The duchess, an artist with an excellent eye for shape and proportion, drafted in the whole family to help clear the woodland to make room for the new arrivals. “They used hedge knives and saws to cut spaces in the R ponticum by the road. I remember my mother running into the house calling out that my father had cut off part of his ear. After they finished, estate workers were bought in to do the drainage.” Space was allowed to plant the tree ferns. Lady Jean adds that though funds were tight, her mother was determined. “She took shares in plant hunter expeditions and was then entitled to a portion of their collections,” she says. Through George Sherriff, George Forrest and Frank Kingdon-Ward, the duchess acquired seeds, which were numbered before being planted. She also acquired two species, R Mollyanum, and later R montroseanum, brought back from the Himalayas by Kingdon-Ward. Currently, three National Collections of rhododendrons represent the riches of the planting: Rhododendron subsection Grandia, subsection Falconera and subsection Madden. Challenges, such as the “unusually high rainfall” in the past 18 months, are tacked with enthusiasm. “It has been tough to carry out the easy tasks at times because the borders have been saturated. We have gone through several pairs of waterproofs. The old drainage system is also a problem, but it is a case of fixing the drains when we can,” says Tim. Thanks to the mild climate, the varied rhododendron collections start flowering in mid-March and continue until May, underplanted with a succession of daffodils and bluebells. At this time the Middle Walk is a striking spectacle, where the full realisation of the duchess’s vision can be experienced. Sited below the cone-lined Bavarian summerhouse built in 1845 for Princess Marie – the last remaining rustic shelter constructed to remind the princess of her homeland – the garden unfolds on both sides of the paths. Around each corner the architectural shapes of richly coloured mature plants are revealed in all their glory, punctuating and framing castle and sea views or highlighting natural features such as the burn. Magnificent white and crimson Magnolia campbellii and rhododendron hybrids are followed by species such as creamy, red barked R falconeri. Lower down scarlet R thomsonii and large leaved white R sinogrande, yellow R macabeanum dominate the paths alternating with castle views. A succession of red, pink and white Camellias flower continually in a small dell alongside deep pink Camellia x williamsii.